The Newbies guide to the Galaxy. Forerunner Gaming First Timer's Guide Newbie Guides The Newbies guide to the Galaxy. Here we will explain a number features we have, how to access them, how to use them, and what exactly they are. 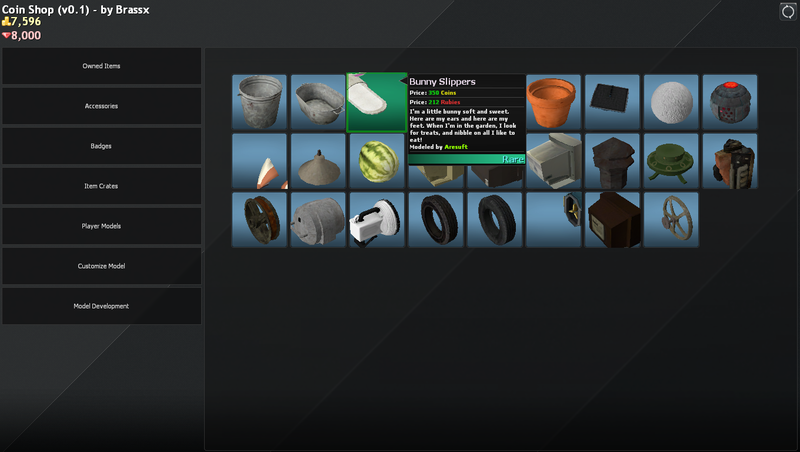 That's right, this Inventory will store all of the items you collect. 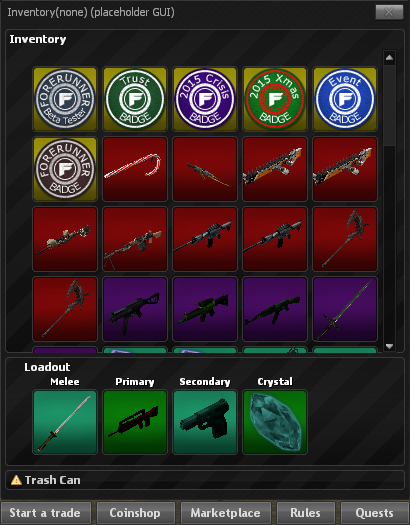 Ranging from post round Drops, opening crates, or buying them from other players. 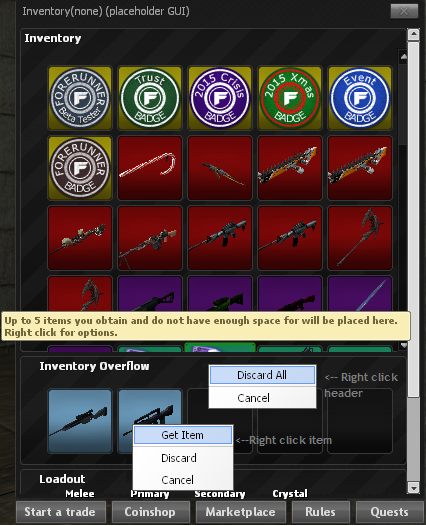 You can access your Inventory by pressing I, or binding a key to "br_open_inventory". This is your Inventory. In it you can do various things, like Equip items by dragging them to the appropriate slots, or right clicking them and selecting 'Equip'. 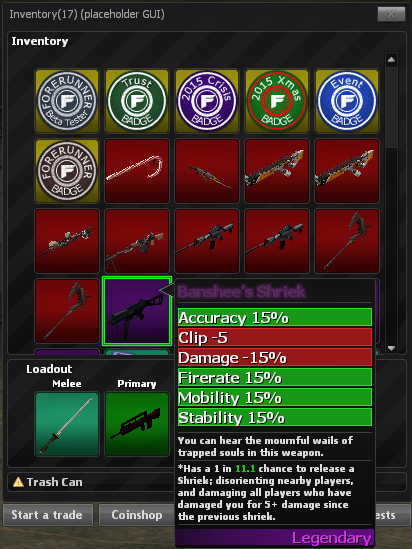 As you can see in the picture, the item I have my mouse on has a variety of stats, displayed by bars. These bars show how good the stat is. If the bar is all the way up, the stat is as good as it can be for that specific item/tier. Some items, like the one shown, have set stats so their stats are always the same, but others have a random variety of possible stats! You can also see that there is a 'Trait' on that weapon. Traits, and suffixes are effects that weapons can spawn with, that do various things, such as shoot laser beams, to dealing more damage to shotgun users. There's quite the variety of these. Suffixes however, will attach to the end of the Weapon name. Such as "Standard M16 of Corrosion". This indicates the tier has the corrosion suffix attached to it. You can remove items via Right click>Remove. These go into what is called your "Trash Can". This will store the 3 most recent deletions so you can restore something if you accidentally remove it. 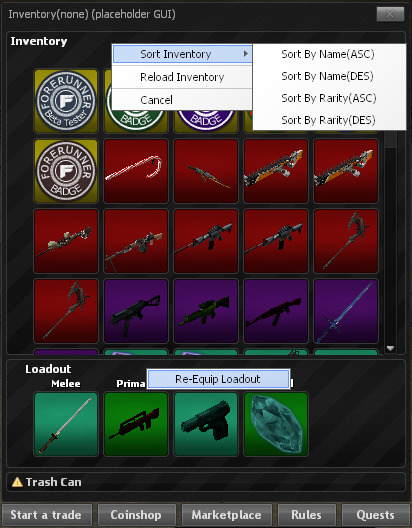 The inventory overflow is a set of slots that appear when your Inventory is full. These slots will hold items you can't get in your Inventory due to there being no space. It will hold the 5 most recent items, and you can choose which ones you want. Terran Wrote: Crystals are basically a temporary buff that provides bonus stats, limited by their "Charge". Each round, as the Crystal says, will drain a percentage of the charge to use the Crystal (So long as it is equipped). The percentage varies, but 4% is about the average. To "Charge" a Crystal to give you percentage and uses, you have to find weapons with a POSITIVE (Green) stat and right-click the Crystal, select "Charge", and then select those guns. It WILL DESTROY the gun, but depending on how much of that stat the gun has determines how much of a percentage a Crystal will gain. When a Crystal reaches their maximum percentage, it will gain a "Charge", and you can charge it to whichever maximum percentage the Crystal can hold again. Each Crystal can have up to 10 Charges. The stat that you require to charge and how much will be labelled on the Crystal. For now, if you want to test this, your best bet is a Blaze Crystal. These handy things lower fire damage AND explosion damage by 65%! They only require the Damage stat to charge, so Standard or other sub-par weapons can juice 'em up quickly. As you see in the picture above, there's three stats. "Charges" are basically how much 'power' the crystal has left, a crystal can not be equipped or used if it has a charge below it's drain rate. "Current Charge" is how close you are to the next charge(so above, My crystal has a total of 29% mobility added to it, and it needs 40% to add a charge), this value is NOT touched when the crystal is drained. This means, in order to add any charges to your crystal to use it, you must get "Current Charge" to it's max, so it resets and adds a Charge to "Charges". You also see in the description, that it drains 5% off of a charge each round it's used. that's .05(5/100) off each charge. That's 20 uses per charge, which should help people not be so scared to lose charges. If needed, I can make it drain less. Firstly, if your crystal needs to be charged you simply right click on it, and click "Charge". Everything tinted red can not be used to charge the crystal(various reasons why). As you see in the top right, it has the Jump Crystal, and how close it is to a next charge represented as a % and as well as the real value. There's also some more info about it in the bottom left(along with an INFO button to give you some insight on how to charge). After you insert the weapons you wish to use to charge the crystal, you simply press charge(then press Yes on the confirmation window that pops up)! Do note, you need to at least get that bar to 100% to add 1 charge to your crystal. Each 100% 1 charge is added, so if you add a total of 300%(in this case it would be 120 total mobility) to the crystal in one go, 3 charges will be added. THE WEAPONS ARE DESTROYED FOREVER SO CHARGE WITH CAUTION! You can type !market or click the market button to access the global market. You can also browse/buy off this market via the Forums. You can right click any non-coinshop item and click "Get Estimated Price". This looks at previous market transactions for items of similar quality(yes includes traits), and calculates an average price. Just to more or less give someone a quick idea of how much something MIGHT be worth. This is your coinshop. This is where you can purchase Accessories for your Character, player models, and Item Crates. You can open it by typing in !coin, /coin or clicking the Coinshop button in your Inventory. The top left shows your Coin amount, and your Ruby amount. Rubies are a Donator currency. They get it via the Donation store, it is nontradeable. 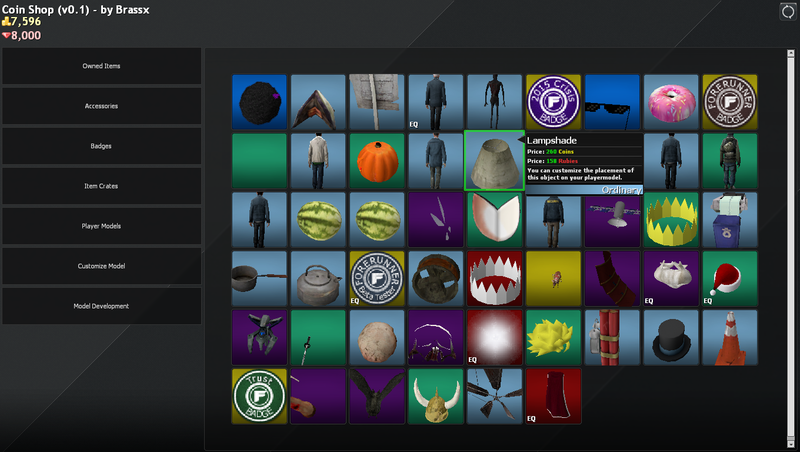 If you clicked "Owned Items" it will display all Coinshop items you Own, and allow you to equip them, un equip them, and transfer them to your Inventory for trading/storage purposes(Note: When you transfer an item to your Inventory, it will maintain it's customized position, scale, rotation, and anything else you changed. 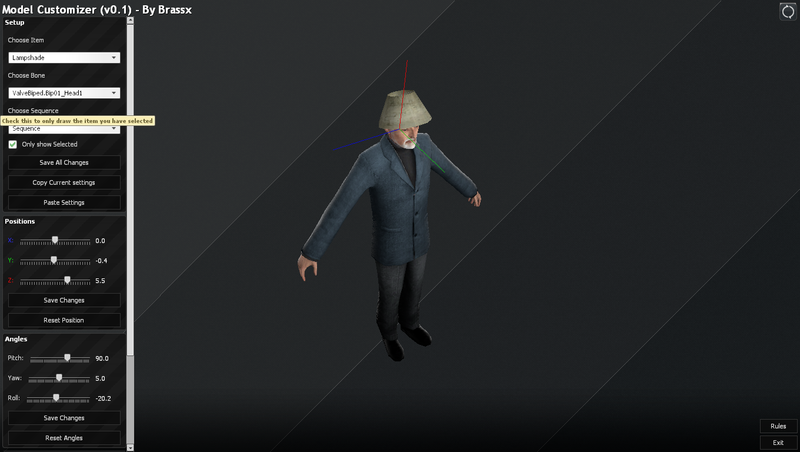 So players are able to sell 'outfits'.). As you can see, I have a variety of items owned(notice the EQ printed on some, that means I have those Equipped). Let's look at this Lampshade. Let's equip it! 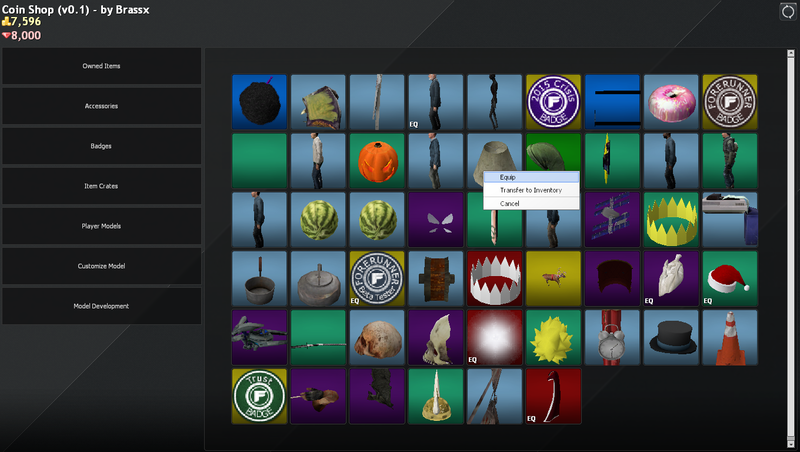 And click on "Customize Model"
Here you see all of the items I currently have equipped, and can select one you wish to modify. Let's select the lampshade, then click "Show selected item only". This will make it so only the item you are editing will display. Then you just move around the various sliders, attach it to different bones. Make it look however you'd like! Click save all, then you're done! If you wish to get more stuff to customize your player with, click on the various tabs, and see if you can buy anything! You can also try your luck at trading other players for them, or getting them from crates/drops. There are rare ones you can only get from drops or crates too. You can type !trade username to send a trade request to a player, or use the "Start a Trade" button in the Inventory. 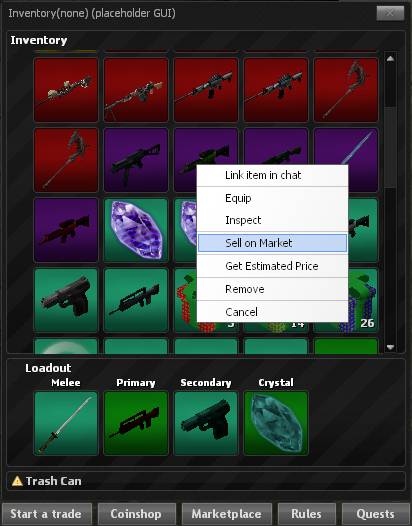 If they accept a new window will popup, showing some trade slots, a trade chatbox, and your Inventory. 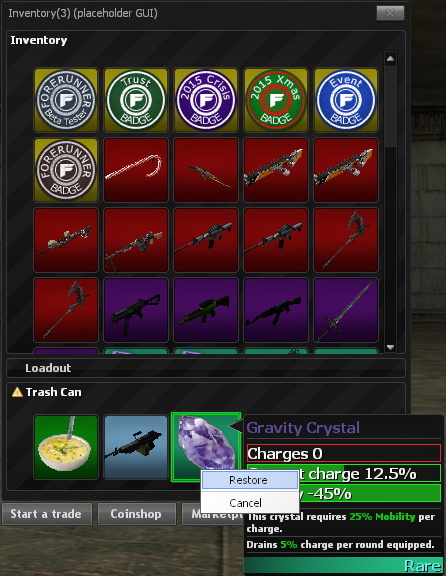 You can click on items in your Inventory to offer them, you can also right click on the other players offered items to check their Estimated price out. 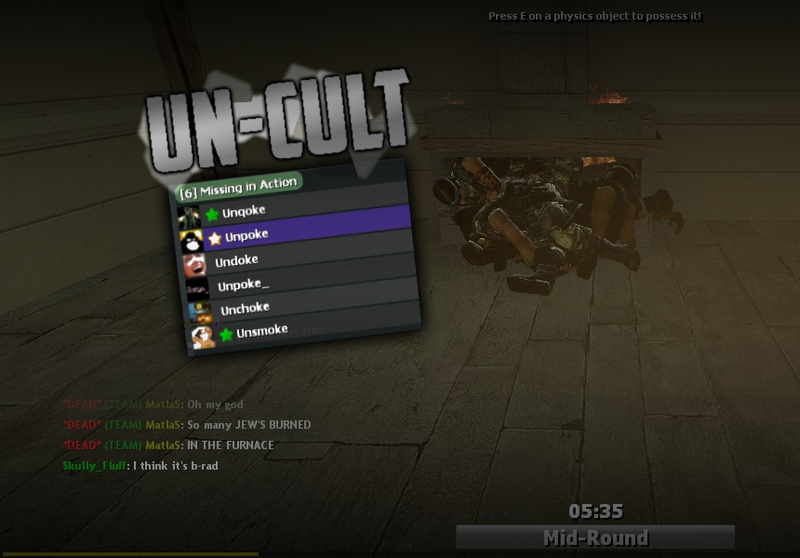 FRG Features 'Minigames' that have a chance to happen during normal TTT rounds. 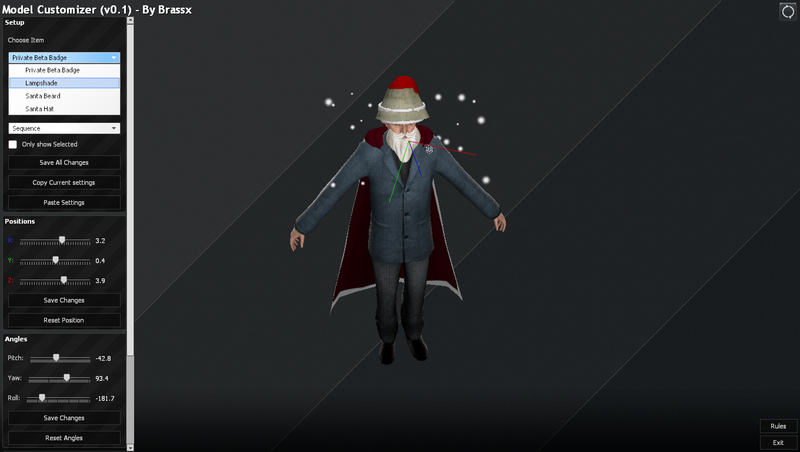 There are currently 3 minigames, Orbital Survival, Snowball Fights, and Dragon Rounds. 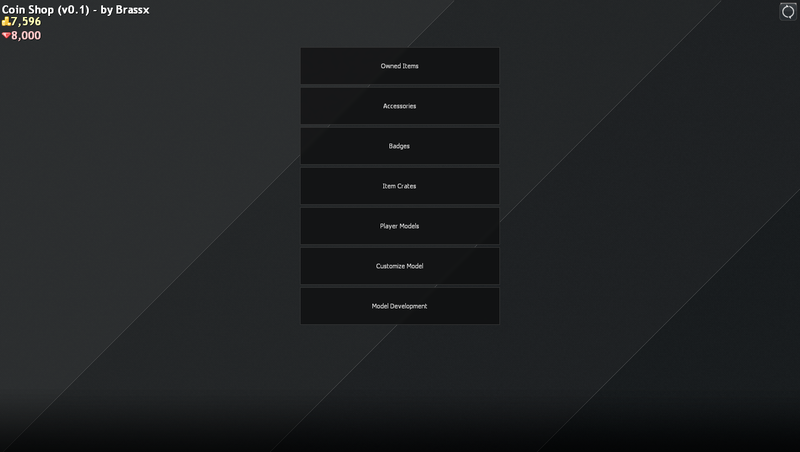 Orbital Survival is a minigame inwhich the last person standing wins. Beams of destruction will shoot down from the sky in waves, until everyone is dead. Snowball fights is another last one standing type. Basically, everyone gets snowballs and you have to throw and hit players with them s to eliminate them. Last one standing wins! Dragon Rounds, one person will spawn as a giant Dragon that can shoot fireballs. You must work together with your team to defeat the Dragon and win! More damage dealt = better drops. Or as the dragon, more HP left = Better drops. You can type !lobby to join the Lobby server. You must be at least level 10 though to join it! Dueling, with betting. You can 1v1 someone and stake items! If you win you get your bet back, as well as the other persons bet! Casino - This only Includes Slot machines, and Texas Hold 'Em at the moment. Weekly Quests. You can talk to the NPC in the Center of the Lobby (with the Quests Label) to view this weeks quests, and select 2 of which you would like to try and complete. You can complete them all, but can only have 2 at a time in your Quests window. You can type !quests at any time to view your current quests. These award "Forerunner Fragments" Which you can use at some of the Vendors found in the Lobby. Weekly Weapon/Crystal shop. These shops sell 3 random items(aswell as a chance to sell unique items only found in the shop), for Forerunner Fragments(you obtain them for completing quests). The crystal shop sells fully charged crystals. Events. FRG will likely continue to have seasonal events, and NPCs that visit the Lobby temporarily, and request you to do things for them for a reward. Worm Queen. A solo boss you can kill once a day after you complete the appropriate quests. You also must be the required level. Bank. You can store items here. You are started out with 50 slots, but can increase it up to 250 bank slots! These accessed via the Lobby server, in which you must reach Level 10 to access. This event is available by completing the "Grim's Request" quest, or you can join the party of someone who has already complete this, and attempt the Labyrinth(the 'Raid'). 4 - 6 players required. You can take a team of 4 - 6 players and try and survive as long as you can from endless waves of zombies in this experimental underground laboratory. I will be adding more to this post soon. But Texas Hold Em still dosent work so technically isnt there only one gamble technique? Community be like:"That wasn't very cash money of you"
Well, this is long, let me give it a good read! Edit: Oho, thanks for including that little Crystal thing of mine! (12-29-2015, 08:09 PM)CobaltIsAPimp Wrote: But Texas Hold Em still dosent work so technically isnt there only one gamble technique? It works. Jake, Grass and I tested it last night, and it ran pretty well. Just a few bugs, so I likely will release it today. wow, you have a candy cane, nice cheats.